Getting ready for the big wedding, check this a elegant love knot design comfort fit wedding band that is 7mm wide. 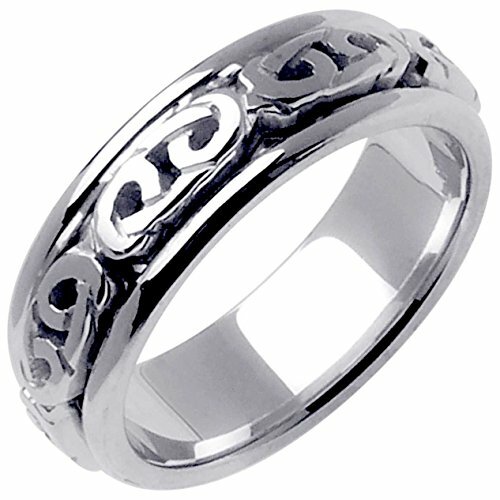 A celtic style in solid white 14k white gold metal, this ring has 58.5 percent pure gold based from its total weight. We have a 14K stamp inside the ring. This was rhodium plated for a brighter white luster. Rhodium plating is a common practice in gold jewelry to enhance the white color from the natural pale light yellow color of white gold. Manufactured in the U.S.A. Manufactured using the die struck process for better durability and minimal porosity. This ring can be resize from size 9.25 to a size 10.25 by a professional jeweler, but fees may apply. Please be aware that any third party modification done on the ring will void its warranty. The actual color of the product may vary slightly from what is shown in your computer or tablet. The weight of the ring varies depending on the size, let us know the size and we will tell you the weight. If you are not sure of your size? Request a free ring size gauge, just email us your shipping address. To receive the FREE ENGRAVING, a $35.00 value, please email us the message and the engraving font either arial or script after you have placed the order. Also get a FREE upgrade from ground shipping to 3 DAY ship, you may return or exchange within 30 days. Please email us for any question or concerns. NOT SURE OF YOUR SIZE: request a FREE ring size gauge, email us. SOLID GOLD AND COMFORT FIT: 14k White Gold alloy with 58.5 percent pure gold. Tested (assayed) to ensure quality before they are shipped. If you have any questions about this product by Wedding Rings Depot, contact us by completing and submitting the form below. If you are looking for a specif part number, please include it with your message.